On December 13, Minister Ma Hui was invited to attend the Meeting jointly held by the Institute of Directors, City of London Branch, and the All Party Parliamentary China Group (APPCG). Altogether 60 people, including Alastair King, Chairman of IoD City, David Stringer-Lamarre, the former Chairman of IoD City, the representatives of the corporate members of the City of London Branch, Lord Clement -Jones CBE, Deputy Chair of the APPCG, and the Lords and Members of the Parliament of the Conservative Party, the Labour Party, the Scottish National Party, and the Liberal Democrats, were present. In his speech, Minister Ma briefed the participants on the major outcomes of the 19th National Congress of the CPC (NCCPC) and the positive progress made in the "Golden Era" of China-UK relations in 2017. He said that the 19th NCCPC is of great importance to China's future development and will bring great opportunities to China, the UK and beyond for deepening cooperation and achieving mutual benefit and win-win results. He commended IoD City and APPCG on their efforts in enhancing mutual understanding and cooperation between the business and political sectors of China and Britain and expressed the hope that the two organizations will make new contributions to the China-UK friendship and cooperation. Chairman King said in his speech that IoD City of London Branch will pay close attention to the development of China and is ready to devote itself to promoting the cooperation between Britain and China in finance and other fields. 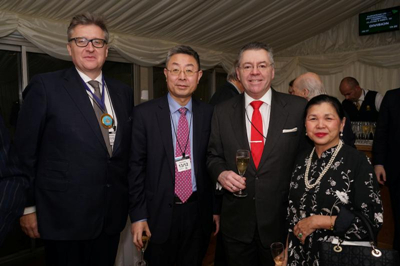 Lord Clement-Jones spoke highly of the achievements of the 19th NCCPC, saying that after last month's visit to Beijing, Guangdong and Guangxi, led by Vice-Chair Will Quince, the APPCG delegation, especially the new members of the British Parliament elected in 2017, have gained better understanding of China. The China Group is willing to further deepen the exchanges and cooperation with the NPC of China, promote the exchanges between the political parties of the two countries, and help deepen UK-China relations in the "Golden Era".